Whether we’re celebrating or commiserating, humans often use alcohol to regulate their emotions. Champagne at a wedding elevates the mood, whereas whiskey after a heartbreak might help some people cope. But is this link between how we feel and how we drink a real one? And can we ever really know why we do the things we do? Henry Austin of the CARE lab at UWA and the ADAPT lab at the University of Amsterdam is working to understand these ideas in his PhD. Learn how some simple stockings can reveal the complexities of human motivation and whether anagrams inspire emotional drinking in this Particle podcast. Does it not infuriate you that you might not ever get an answer? Yeah, sometimes. Sometimes it does. Maybe not infuriate, but it can be frustrating when something is really difficult to predict and it’s difficult to nail down, but I guess that means that you have a longer research career ahead of you. Hello and welcome to the Particle podcast. My name’s Kirsten Flint, and today we’re joined by Henry Austin from the Centre for the Advancement of Research on Emotion or the CARE lab at UWA in collaboration with the Addiction Development and Psychopathology lab at the University of Amsterdam. Hello, Henry. Nice to have you with us. Hi Kirsten, nice to be here. Today Henry’s going to talk to us a little bit about emotional drinking, which is something that he’s investigating for his PhD. What is emotional drinking? Emotional drinking is drinking alcohol when we feel good and drinking alcohol when we feel bad. So there’s two types. For example, we might drink to celebrate after a good day, or we might drink to cope after a bad day too. And people say that they do this quite a lot. The thing that we don’t know is whether this link between emotion and alcohol consumption or drinking is a real one. Why? Why would we even question whether that link is real? Well, people say that they do this, but what we find in research is that people aren’t really very good at knowing the reasons for doing things. So I can give you a good example of that. There was this great study where some researchers took four pairs of identical stockings, right? So all the stockings were the same, and they asked people to pick their favourite pair of stockings, and people selected their favourite pair and they came up with lots of really wild reasons for why this pair of stockings was better than all the rest, bearing in mind that they’re all the same. So for example, they might say, or these people did say that the colour was better sometimes, the texture was better sometimes, the workmanship was better on this pair of stockings than the others. But in actual fact, about 70% of the time, they were picking the stockings towards the right-hand side of the table. So it wasn’t really about the texture or the workmanship or the colour, it was just actually about the position of the stockings on the table. And even when the researchers asked those people, “Do you think the order of the stockings has anything to do with which one was your favourite?”, they would adamantly deny that. So they thought that really order had nothing to do with their choice. What we know from that is that we can’t always trust what people say about the reasons for them doing things, basically. So if we’re really not that good at understanding our motivations, what does that mean for emotional drinking? It means that we don’t necessarily know if emotional drinking is a real thing or not because we can’t necessarily trust people when they say that they drink more in response to emotions. OK, so how do we get to the bottom of this problem of whether emotional drinking is real or not? Hmm, good question. Well, what you would do is you would get a group of people and you would ask them how does positive mood or feeling good affect your drinking and how does feeling bad affect your drinking. Once you’ve done that, you would then want to give them an experience to make them feel good or make them feel bad. So what we did in our research was we got these people to complete or to do an anagram game, and what they thought about this anagram game was that it would measure their intellectual ability and in fact they thought this experiment was about the link between intellectual ability and their ability to taste. So there were two versions of this game. A feel-good version and a feel-bad version. In the feel-good version, people would get really easy anagrams, so they would get presented with a word puzzle and they would have to solve that word puzzle. In that feel-good version, they were really easy puzzles and they would be told on the computer screen that they were doing really well in comparison to other people, right? They’d feel really good about themselves and their intellectual ability. On the other hand, the feel-bad version had really difficult puzzles. They were really hard to solve—I can’t solve them—um, and we would give them some feedback to show them they were doing really badly in comparison to other people, even though that wasn’t real. And so that’s how we would make people feel either good or feel bad in the laboratory. It’s all very devious, this psychology thing, isn’t it? Yes. It has to be devious because if we’re not devious and if people know what we’re actually measuring, they will start to change their behaviour to make themselves appear really good so that, that can be important with alcohol consumption. So if we know that, if people know that we’re measuring how much they’re drinking, what might happen to you or I Kirsten is we might drink less because we don’t want to be judged for drinking alcohol. So that’s why we do have to be a bit deceptive and devious in psychological research because we won’t get an accurate picture if people know what we’re doing. OK, so once you’ve played that horrible trick on people and they’re either feeling good or they’re feeling bad about their ability to do word puzzles, then what? Then you would bring in a glass of beer for them. So for, in my research, I told them that we were interested in taste and the perception of taste, so I would give them this beer and a questionnaire which asked them to rate the beer—how much they liked it, what flavours they noticed, stuff like that. In actual fact, what we were interested in was not the taste but how much of that beer they consume during that time. And the purpose of that questionnaire is to distract them from the fact that we actually want to know how much they drink. So what, they would drink a bit of the beer, fill in the questionnaire, say “Mmm, yes, delicious, I love the flavour”, then they’d go away and you’d measure it? Measure how much was left? Exactly, yeah, so I’d give them just a couple of minutes, all the same amount of time to, to complete this “taste test” in inverted commas. And then I would measure how much beer they drank during that. And then with that, we can, we can see if what they say about themselves matches up with what they actually did in the laboratory, and then we can see if emotional drinking is a real thing or it isn’t a real thing. And is it a real thing, Henry? But also what we know is that some people do this and some people don’t actually. So it’s not universal to everyone. So there’s something that’s different about different people that might explain why some people emotionally drink and some people don’t. And what might some of those things be? Well, there’s certain things about our ability to control our drinking that are different amongst people. So, for example, some people might get a craving for a drink, and they’re very able to say “No, I don’t think that’s gonna help me right now” or “I don’t think that’s the right time to do that”. For other people, they might get the same craving for a drink, and they might find it really hard to say no to that craving. So it’s kind of a bit of a battle in our brain between a subconscious thing telling us you should have a drink and a conscious thing saying that’s not a good idea because alcohol can be harmful. So one thing that I’m investigating in my research is differences in our ability to say no to a craving. And in psychological research, we call that inhibition. That’s our ability to say no to stuff or to control our actions. So that’s something that I’m investigating, and I’m wondering if when we are in certain mood states it might be harder to use that inhibition and it might be harder to say no to that craving. And I’m wondering if that’s a thing that’s different in these people who say that they emotionally drink. That’s so interesting. Can you, um, can you explain how you might test that? Yeah, we can test that with a computer game basically. What that computer game requires is for people to control an action when they’re presented with a picture. So, for example, the computer game might ask you to press a button when you see a picture of a soft drink but not press a button when you see a picture of an alcoholic drink. So what we might be able to do with that computer game is actually assess how easy it is for people to control a behavioural response, which in this case is a button press, and how difficult that might be for them once they’ve been made to feel good or feel bad. And is that sort of inspired by the same anagram sort of puzzle? Absolutely. What we could do is we could take the kind of experiment that we described before, and just after making them feel good or making them feel bad, we could use this computer game to see how good they are at saying no to an alcohol picture and withholding that response of pressing a button and then we can see if that is related to how much they drink later. Any significant findings so far? Yeah. What I found with one study in inhibition is that, for people who say that they drink when they feel bad, they found it extra difficult to say no to the alcohol picture or to inhibit a response when they were made to feel bad. So that, if we translate that into the real world, what that looks like is someone, once they’ve been made to feel bad, someone having trouble saying no to the offer of alcohol or a craving for alcohol. Mmm, just picking up on that idea of translating into the real world, how important is it that we actually test people’s ability to be able to press a button when confronted with a picture of either a soft drink or a beer? Like is that really important? Great question. I think so. Although I’m biased because it’s my research, but I think so because we know that drinking when we feel bad is associated with unhealthy drinking habits, and actually to a lesser extent, drinking when we feel good is also associated with unhealthy drinking habits. 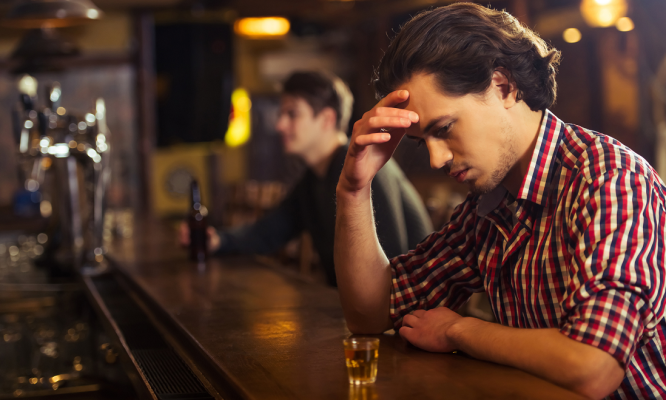 So if we can find out not only if people engage in emotional drinking but also how that happens, there are certain things that we can do to specifically address that. For example, if we know that emotional drinking happens because people have difficulty saying no when they’re feeling emotional, we can target that in therapy, and what we might do for that is give people some skills to actually say no to a craving when they’re feeling good or they’re feeling bad. For example, we might encourage people to do something more healthy when they feel good or they feel bad, and that might look like therapeutic strategies like mindfulness to help people overcome that feeling bad, for example, or it might be something that they can replace, so at the moment, they’re responding to feeling bad by drinking, but what’s something that they could do instead that’s healthy, like maybe read a book? And that’s actually something that takes practice. So it’s an automatic response for these people, and what we want to do is we want to give them a new automatic response. For example, when I feel bad, I do my mindfulness, or when I feel bad, I read my book. So that kind of sounds like you’re, you’re rewiring the brain. It does, and it is in a way, in fact, all therapy, whether it’s for an addiction or for your emotions too is actually involves rewiring the brain a little bit. So it sounds like the benefits of this kind of research really could be quite wonderful in a clinical setting, but what would be the barriers to getting there? Great question. Because there are a few, and I guess the challenge with any kind of research with human behaviour is that we’re really unpredictable, so in many other sciences, I mean I’m not a physicist or a chemist, so I don’t want to say that their job is easy because it’s not, but in a way, those kinds of sciences and more predictable. When you do this thing, when you’ve changed this thing, this thing changes really reliably, and by that I mean when you change this thing, it almost always affects this thing, but humans are really different in that each one of us is so individual that it can be really hard to come up with a rule for everyone. There’s lots of reasons that we do the things that we do, not just one, so that can make it really hard to predict human behaviour like emotional drinking. For example, I test, I measure how much people drink, right? And we hypothesise that’s affected by their emotional state. But imagine if I’m someone who drinks when I feel good and I go to an experiment and I feel good and I get a beer, but I have an exam later, then that might be a reason that I don’t drink alcohol that day. So there’s just lots of reasons that might influence our drinking, for example. And it’s really hard to control for all those other reasons that might be affecting your study. Well that sounds incredibly frustrating, Henry. Yeah, frustrating, but also I think that’s what makes it fun. It is really unpredictable working with humans, so that’s why I’m doing this kind of research. Well, I think that might be all we have time for today. Thank you very much for joining us. I think it’s about time we go get a drink. Actually, though, is it 5 o’clock yet? The Particle podcast is supported by Scitech, empowering all West Australians by increasing awareness, interest capability and participation in science, technology, engineering and maths.